The action-camera giant jumped into the virtual-reality space this week with the acquisition of French company Kolor. Called a “spherical media company,” Kolor makes software to combine multiple photographs or videos to produce panoramic and spherical content for viewing in an immersive virtual-reality display. 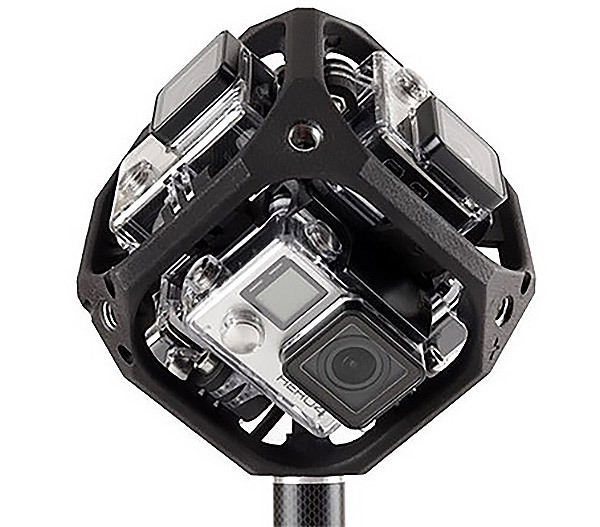 Footage is captured with multiple GoPro cameras aimed in a 360-degree array. The company sells a mount for spherical capture on its professional products page. GoPro released a video to demonstrate the effect, called “Land, Air and Sea,” which you can watch below. It allows a viewer to interact with the screen — click and drag the video to reveal a 360-degree world. I tried it on a Chrome browser. The video loads like any other YouTube content, but once the film begins you can click anywhere on the screen and pull other perspectives into view. Grab the screen in “Land, Air and Sea” and you can toggle over to reveal a dolphin swimming ahead of a boat. On a paragliding scene, grab and move the screen to look straight down. This option only works in the Google Chrome browser now for desktop. For mobile viewing, you can download the Kolor Eyes 360° video player app (for iPhone or Android).